Forests provide numerous ecosystem services related to climate change, water, and biodiversity, among others. By providing all of these important services, forests clearly play a critical role in enabling a healthy functioning planet and economy. Forests attract tourism and enable environmental conditions and resources that support flourishing societies. Indeed these services have economic value, measured in terms of the ecosystem service they provide to support society, and of course they also have an immeasurable intrinsic value that we can all appreciate. It’s estimated that the global value of forest ecosystem services may run to several trillions of dollars annually, yet these services are rarely paid for by the industries and communities which benefit from them. A number of different economic valuation approaches have been developed to determine the value of ecosystem services provided by forests, including the opportunity cost of foregone timber sales, the value of tourism, and willingness to pay calculations. While many argue these calculations do not capture the full, intangible values of forests, placing value on forest services helps make the case for their continued protection and increases the profitability of conservation. In the absence of these kinds of incentives, landowners might not choose to conserve their land. Marketplace incentives to keep forests as forests can help maintain the multi-functional role of forests in providing these ecosystem services. If forest owners choose to take advantage of timber sales, that revenue may help provide the funds for the type of management that will help to protect some of the key ecosystem services that the forest provides. Businesses that source from responsibly managed forests can help tell the positive story of forests in their supply chain, describing for instance, how sourcing from responsibly managed forests helps to maintain critical habitat, promote water quality, and fight the impacts of climate change. These stories are overlooked in the marketplace and both brands and consumers would benefit from telling them. The relationship between forests and climate change can be seen from two lenses: First, forests play an important role in regulating the global climate system and can help mitigate climate change. Second, climate change can and is impacting the world’s forests, which calls for a need to manage forests in ways that make them healthy and resilient to these impacts. Forests play an important role in the global climate system by removing carbon dioxide from the atmosphere and storing it in the form of carbon in their leaves, roots, branches, trunks, soil, and woody debris and other plant litter through a process known as “carbon sequestration.” Fifty percent of a tree’s biomass is carbon which remains stored, acting as a carbon sink. Through this process, forests play a role in both regulating Earth’s climate and moderating the effects of global climate change. Forest products also capture forest carbon in the form of paper, timber or pulp products. Forests are the second largest global storehouses of carbon (after oceans). Globally, forests store the equivalent to about one tenth of carbon emissions projected for the first half of this century. According to the UN, stopping the conversion of forests and restoring damaged forests could provide up to 30% of the climate solution needed to keep global warming to 1.5 degrees Celsius. Keeping forests as forests is therefore critical for meeting international ambitions to prevent dangerous climate change. Since 1990, land use, land-use change, and forestry activities in the United States have removed more CO2 from the atmosphere than they have emitted. In 2016, the net CO2 removals from these activities offset almost 12% of the nation’s total greenhouse gas emissions. Land use, land-use change, and forestry activities is therefore considered a net sink. One major reason is the net growth of forests, which as we discussed in Module 1, exceeds forest removal in the U.S. In many other countries, the opposite is true: where large areas of forestland are cleared, often for agriculture or development. U.S. forests continue to sequester significant amounts of atmospheric carbon and provide an important offset to the Nation’s carbon emissions, despite widespread natural disturbances like wildfires. In the face of a changing climate, it is also important to ensure resilience of forests and ecosystems, and well-managed forests are more poised than unmanaged forests to play this role in fighting climate change. Unmanaged forests are more prone to catastrophic wildfire than managed forests, which also release tremendous amount of carbon. Active and responsible forest management, like what you find in many of the certified forests in the U.S., Canada and Europe, helps to minimize these occurrences, for example through expanding, restoring,managing forests to encourage more carbon sequestration by balancing harvesting and regrowth. In the United States, scientists say the carbon-removal potential from these measures is hundreds of millions of metric tons of CO2 equivalent per year. Well-managed forests, either managed by government or private entities, can help protect against negative climate change impacts in forests. When managing forests for climate change, it’s important to understand that not all forests everywhere are the same in terms of their ability to sequester carbon and moderate the impacts of climate change. The amount of carbon stored within an area of land varies according to the type of vegetative cover present in above and below ground biomass, dead wood and forest floor litter, and soil carbon. Climate also matters when for managing for carbon sequestration. While tropical forests store most of their carbon in vegetation for example, boreal forests in the north store vast amounts of the carbon in soil and peatlands in addition to its trees. Therefore different climate zones call for different management strategies to maximize carbon sequestration opportunities. Measuring the carbon stock of forests can identify areas that feature particularly high potential for carbon storage and target them as areas to set aside for conservation or for specific management plans that help to maximize carbon sequestration. There are various methodologies for quantifying and measuring carbon in forests, which vary based on climates and contexts. Identifying high carbon stock areas helps companies and manufacturers plan for development of plantations of agriculture or trees to meet supply chain requirements while ensuring that key high carbon stock areas are protected from conversion and managed in a way that reduces climate change impacts in their supply chain. It should be noted that all forests contribute positively to the carbon equation, even if they are not considered “high carbon stock” areas set aside for conservation. Improved Forest Management – where better, sustainable forest management increases carbon in the forest and in durable, harvested wood products. Most types of improved forest management project methods permit timber harvest, as long as standing forest carbon increases above baseline over the project term. Forest carbon offsets can help create an incentive for forest owners to engage in land management practices that retain or restore forests and enhance forest carbon sequestration capacity when they get paid to do so. Some examples of where these occur are though California’s Cap-and-Trade program and schemes that have evolved out of the REDD+ UN mechanism. Forest certification is another marketplace mechanism to value forests in ways that reward their sustainable management. It gives marketplace assurance to companies that source forest products that these products originate in sustainably managed plantations and forests. Some carbon market standards require that forests where timber harvest takes place also achieve forest certification to generate offsets. The relationship between forests and water can be understood both in terms of water quantity and quality. Forests absorb water through their roots and release some back into the atmosphere in a process known as transpiration. Forests create what are essentially rivers of water in the air that form clouds and create rainfall. Deforestation, especially in tropical forests, are associated with droughts in many parts of the world. Forests also facilitate water capture and storage. Forested watersheds ultimately supply water resources for domestic, agricultural, industrial and ecological needs. Globally, forested watersheds and wetlands supply 75% of the worlds accessible freshwater. 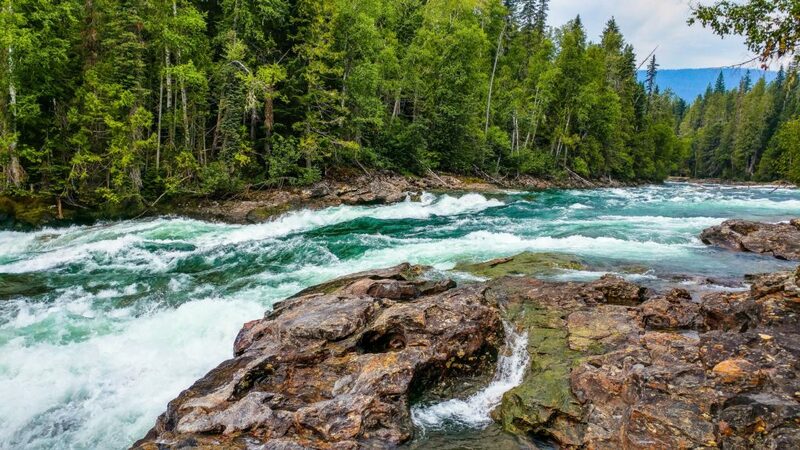 More than half of the drinking water in the U.S. comes from a forest and nearly 2/3 in Canada. Forested watersheds also provide water purification that plays a key role in water quality, as tree roots and organic matter on the forest floor filter pollutants and runoff from natural and human sources, cleaning the water before it reaches local water supply. A tree filters more than 36,000 gallons of water per year or 100 gallons a day. By making choices that keep our forests as forests and not converting them to other uses, we are keeping our water clean. Best Management Practices (BMPs) for water in forests were established in as part of the US Clean Water Act and states maintain these requirements. Today, the U.S. continues to uphold these rigorous standards to protect the nation’s water supply through careful management, with many states requiring even more rigorous standards. Specific BMPs vary, but for example, it is a best practice to avoid harvesting or development close to water bodies and to protect and re-establish riparian forest buffers, which are trees, shrubs, and grass planted along stream sides that buffer pollution and reduce bank erosion. These BMPs are implemented broadly nationwide. Between 2005 and 2013, rates for forestry BMP implementation averaged over 90% in the U.S.
Certification programs support these BMPs through requiring their effective implementation, for example through logger training, landowner outreach, and water quality related management requirements. Green infrastructure is a term used to describe the ecosystem service benefits that natural systems can provide society in lieu of man-made infrastructure. Water filtration is one service commonly associated with capital intensive infrastructure investment in man-made water filtration systems, but which can also be performed by forested watersheds. 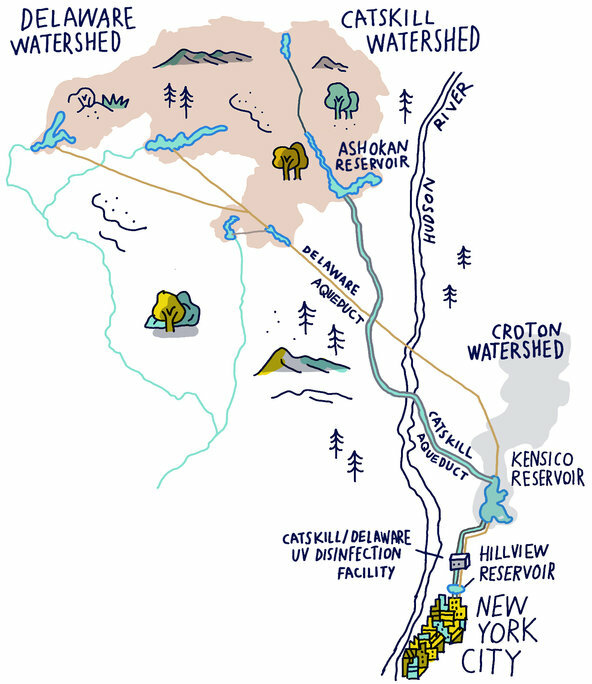 In a now famous case study, New York City’s water utility invested in green infrastructure to provide the city’s tap water from forested watersheds in the nearby Catskill mountain region, where forests help protect a network of reservoirs that provide the unfiltered drinking water. The New York City drinking water supply system is the largest unfiltered water supply in the United States. It provides approximately 1.2 billion gallons of high quality drinking water to nearly one-half the population of New York State every day. Thanks to these watershed services from forests, the company saved 6.5-8 billion USD in filtration costs over 9 years compared to investments needed for man made infrastructure to capture and filter water. As long as the forests remain forests, these filters will never need to be replaced. Well-managed forests can help protect and restore critical water resources. Forest lands are vital in maintaining habitat for many of the world’s plants and animals. Forests are home to 80% of the world’s terrestrial biodiversity, which includes complex webs of organisms that include plants, animals, as well as fungi and bacteria. Many of the species that live in forests cannot live anywhere else. For some species, the habitat required is very specific, like a particular type of forest or tree needed for nesting or food. Other species have a broader ecological tolerance, and may in fact require a mosaic of different habitat type in terms of tree species, age, and other conditions. Conversion of forest area, for example when cleared and converted to agricultural land, is a significant contributor to losses of habitat and therefore loss of biodiversity. When forest cover is removed, wildlife is deprived of habitat, and they are unable to survive. Well managed forests can restore and expand wildlife habitat that supports species threatened by climate change and development. This can be achieved by managing forests to support specific habitats of threatened species and making decisions that maintain an overall healthy forest that supports broad biodiversity. The Forest Stewardship Council (FSC) developed the High Conservation Value (HCV) concept as part of its certification standard and the concept has now been generalized and adopted by other certification schemes and organizations. The concept asserts that while all forests are valuable, some are more valuable than others and attempts to define “exceptional” or “significant” forest values, such as those that have concentrations of biological diversity including endemic species, and rare, threatened or endangered (RTE) species, and forest areas that are in or contain rare, threatened or endangered ecosystems or habitats. The framework requires that management of HCV forests maintain and enhance their unique values. SFI also considers biodiversity in their forest management standard by requiring program participants to protect threatened and endangered species, including locating sites where critically imperiled and imperiled species and communities live, also known as Forests with Exceptional Conservation Value (FECV). They require the collection of information on FECV and other biodiversity-related data and a methodology to incorporate this information into forest management decisions.Certification standards also help to uniformly address the needs of general diversity through responsible forest management practices as well as species at risk. Family-owned forests, along with other forests, provide essential homes to wildlife. As we discussed in Module 3, family forest owners are the largest group of forest owners in the U.S. and many care deeply about wildlife as a core value in why they own woodlands. According to AFF, more than two-thirds of the species currently listed under the Endangered Species Act (ESA), rely on these family owned lands for their habitat. In some areas where privately owned woodlands are concentrated, up to 95% of these forest-dependent, at-risk species may live only in private forests. In the Southeastern U.S. alone, the AFF estimates there are 224 at-risk wildlife species that live in these forests. Most of these species are at risk due to the loss of forest habitat from encroaching development and conversion of forests to non-forests uses. Family forest owners can play a critical role in improving habitat but oftentimes there is cost is a barrier as well as uncertainty about what practices to do. AFF works to engage family woodland owners as its core mission and much of this includes consultation and advocacy for wildlife habitat management. Their work includes providing expert advice to their network of family woodland owners and advancing policies that provide family forest owners with tools to conserve habitat. Forests of all varieties (age class, species, regions) contribute to overall biodiversity, including working forests. Working forests where harvesting occurs in sustainable rotations can help to open up new space and create early successional forests (or young forests) which is a habitat that many species depend on. Research has shown that declines in young forests have contributed to the decline of some pollinators and songbirds. These young forests represent healthy levels of forest regeneration and are created naturally through disturbances like fires or wind storms. Harvesting can mimic these natural disturbance patterns and can be performed in a way that manages for different age classes and for species that require young forest habitat. Healthy levels of biodiversity also in turn contributes to the productivity of working forests. On average, a 10% loss in biodiversity leads to a 3% loss in productivity and so maintaining biodiversity has great economic value. Biodiversity provides invaluable benefits to society like genetic diversity that gives us varied food sources, medicines, timber and non timber forest products like oils, waxes, resins, fragrances, textile materials and dyes, outdoor recreation and tourism. Biodiversity is perhaps the most difficult forest ecosystem service for us to directly value, but its benefits are innumerable and critical to society. 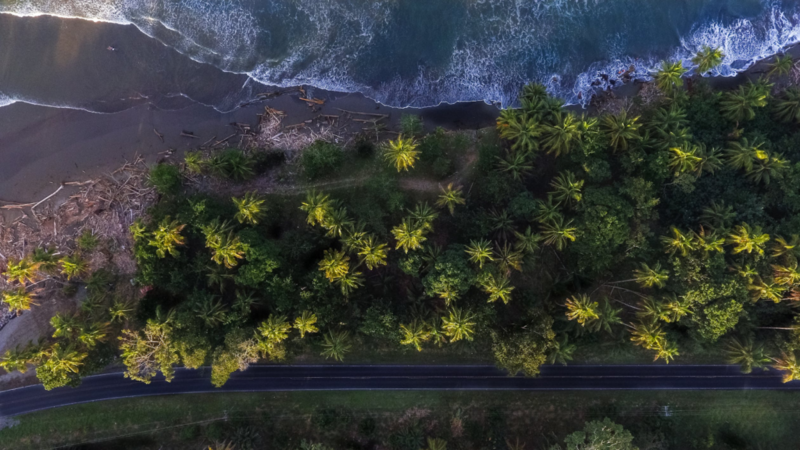 Full landscape-level assessments try to evaluate forests for all of the various services they provide that we have reviewed: climate regulation, water quality, biodiversity, and others. Conserving a range of biologically and ecologically diverse ecosystem services across the land base is an important and comprehensive management strategy. Rigorous forest management certification has long been an important tool for providing assurance of sustainability. These certifications in North America include the American Tree Farm System (ATFS), Canadian Standards Association (CSA), Forest Stewardship Council (FSC), and the Sustainable Forestry Initiative (SFI). Each certification offers forest management certification to landowners and audit the land managers according to a set of objectives and operating principles that uphold the general principles of Responsible Forest Management practices. These include: ensuring sustainable harvest levels and regeneration after harvest, conservation initiatives that protect biodiversity, soils and water quality, social considerations for forest workers and local communities; and assurance of legality/building upon a legal framework.While large tracts of land can be certified (and are in North America which has nearly half of globally certified acreage), individual landowners are responsible for getting this certification and their neighbors may not be certified. This makes it hard to measure ecosystem level impacts since streams, habitat and carbon take place at larger landscape, not property, scales. For this reason, analysis at a broader landscape level offers a great approach to verifying sustainability. Rather than checking that specific practices were applied to specific tracts, a landscape approach considers how the practices implemented across an entire sourcing region add up and their performance for important sustainability values like water quality and biodiversity. As we discussed in Module 2, many certification programs offer group certification to help increase scale. There are also other marketplace tools that help enable a larger landscape level approach. Forests in Focus is a data driven online tool created by GreenBlue and the American Forest Foundation, which offers a landscape-level assessment of risks and opportunities for sourcing forest products by looking at large areas around paper mills known as “wood baskets.” The tool visualizes and analyzes data from the U.S. Forest Service and other trusted providers on key areas. Forests in Focus enables verification of forest products sourcing while complementing other sourcing tools, such as forest certification. SFI’s Fiber Sourcing standard certifies manufacturers of wood products, which source fiber from a variety of forest sources, and requires the manufacturers to show that the raw material in their supply chain comes from legal and responsible sources and must also include measures to use forestry best management practices. The standard contains requirements on biodiversity through promoting landscape assessments, conservation assessments or other approaches, steps taken to ensure good water quality in forestry like training on best practices for harvesting near streams, use of qualified, trained logging professionals, and investment in forest research. This also includes landowner outreach and training for professional harvesters delivering to a Fiber Sourcing certified mill. This program enables the manufacturer to work across a landscape with multiple landowners to ensure responsible practices that help maintain ecosystem service values. Responsibly managed forests provide a myriad of outcomes that contribute effectively to the conservation benefits we all care about like those we have discussed on water, climate change and biodiversity. Many companies also have goals related to reducing air and water pollution. Some companies, depending on their function and what issues are material to them, also have corporate goals around minimizing habitat and species loss. Although not all companies have specific goals on biodiversity, it is a benefit that underlies a thriving environment and economy and produces recreational and intangible benefits that we all enjoy. There are several other common goals companies make that are also related to responsible forest management. For example, many companies commit to using bio-based and renewable materials in their supply chain and products. As we have gone over in this webinar series, wood is a renewable resource and when it comes from responsibly managed forests, it will continue to be regrown and in the process help regenerate forest ecosystems. Companies also commonly commit to responsible sourcing or zero deforestation. 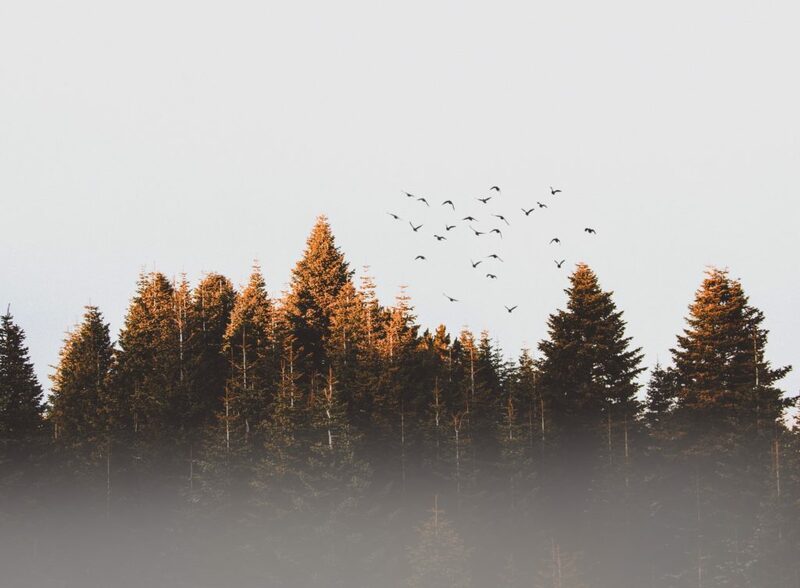 As we reviewed in Module 1, responsible forest management does not include deforestation, and instead involves a sustainable rotation of trees, where some are harvested and new ones are planted leading to healthy levels of forest regeneration and a sustainable supply of renewable materials. All companies use some forest products in their supply chain. Using fiber from responsibly managed forests allows companies to meet all these (and more) sustainability goals and make positive impacts through sourcing decisions. 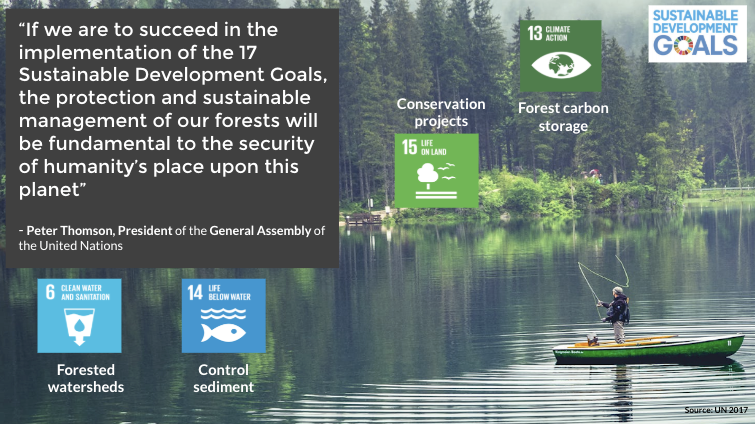 Forests play a critical role in directly achieving the global sustainable development goals related to water, biodiversity, climate change and carbon sequestration. These touch on SDG 6 related to clean water and sanitation, since forested watersheds filter drinking water and also capture and store water for other uses. Forests help increase company and community access to clean water resources through forested watersheds. They touch on SDG 14, life below water, again since so many forests have a relationship with water. Intact forests, especially along streams, can reduce sedimentation which decreases sediment flow into coastal marine environments and protects marine life. Forests clearly touch on SDG 15, life on land, since forests are home to 80% if the world’s terrestrial biodiversity and forest conservation and preventing forest degradation is critical to maintaining life on land. Forests also have significant impact on SDG 13, climate action, because of forests’ core role in carbon storage and climate regulation. 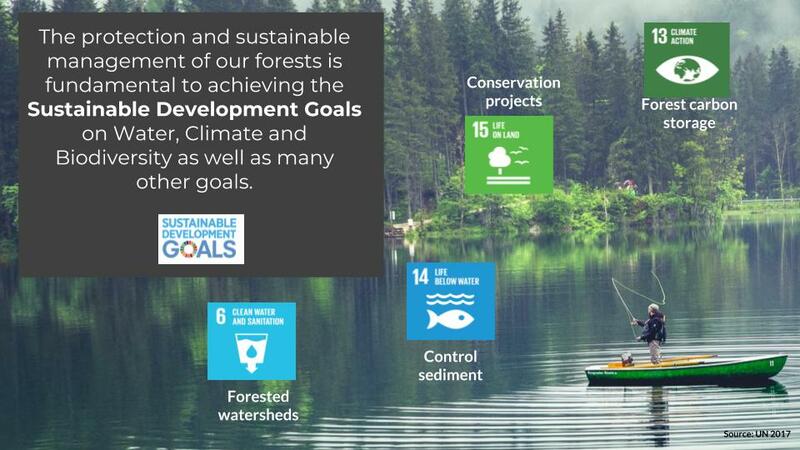 Forests of course also have impacts on all the other sustainable development goals as well since they serve a variety of social, and economic functions that are critical to achieving sustainable development. 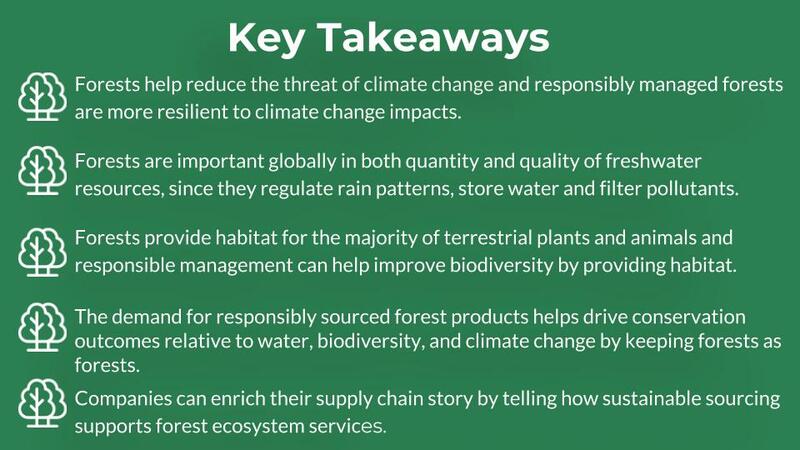 Companies drive these positive outcomes by demanding responsibly sourced forest products, which creates the demand needed to keep forests as forests. Forests help mitigate against the impacts of climate change and responsibly managed forests are more resilient to climate change impacts. Forests are important globally in both quantity and quality of freshwater resources, since they influence rainfall, store water, and filter pollutants. Forests provide habitat for the majority of terrestrial plants and animals and responsible management can help improve biodiversity by improving habitat. The demand for responsibly sourced forest products helps drive conservation outcomes relative to water, biodiversity, and climate change by keeping forests as forests. 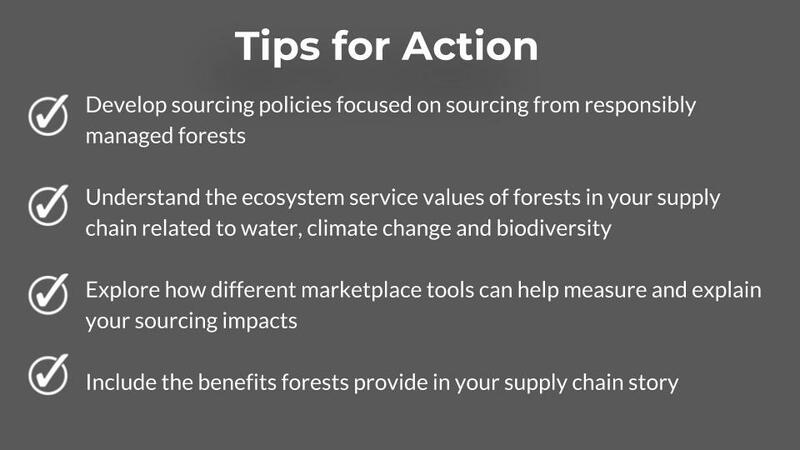 Companies can enrich their supply chain story by telling how sustainable sourcing supports forest ecosystem services, describing for instance, how responsible forest management practices in areas you source from helps to maintain critical habitat, promote water quality, and fight the impacts of climate change.